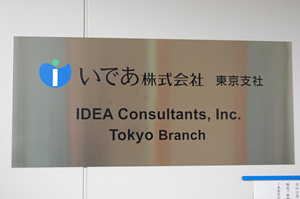 Tokyo Branch Office, IDEA Consultants, Inc. IDEA Consultants, Inc. is an integrated consultancy company, offering unique services across the boundary between construction and environment after the merger of two different consultancy firms, one of which specialized in infrastructure development, and the other in environmental conservation. In the company, "Lithosphere Group" of Tokyo Branch Office takes charge of construction consulting service for ground infrastructure. The Group had been using 2D static linear analysis software "FRAME (2D)" of FORUM8 for reviewing bridge designs. In 2006, the Group shifted its tool from "FRAME (2D)" to "UC-win/FRAME (3D)" applicable for 3D dynamic nonlinear analysis. 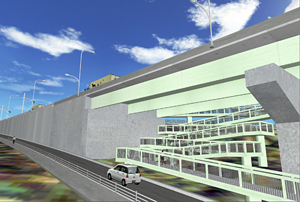 The Group also introduced 3D real time VR (Virtual Reality) software "UC-win/Road" in 2007, partially in order to meet the needs in preparing explanatory materials of projects. In addition, an increase of design achievements of portal rigid frame bridge aroused needs for a tool specially designed for the bridge form, FORUM8 offered customization of the existing tool. We interviewed Mr. Mikio Gorai, Group Manager, Mr. Hideaki Ando, Group Manager, and Mr. Masaya Ichikawa in the Group. IDEA was established at the merger of METOCEAN Environment Inc. and NIKKEN Consultants in the 1st of June, 2006. METOCEAN Environment Inc. was formerly founded in 1953 as Tojo Weather Service Center for offering weather information. After the Public Nuisance Countermeasures Law came into effect in 1967, the Company was reestablished as a general consulting company (new company) for environmental science in 1968. Then in 1969, it was renamed as Shin-Nippon Meteorological & Oceanographical Consultant Co., Ltd., and METOCEAN Environment Inc. in 2001, to reflect its shift in operations and services. On the other hand, NIKKEN Consultants, Inc. was a civil engineering and consultancy firm founded in 1959, putting weight on rivers and highways. Soon they came to respond to the needs of the age when people require security of product quality and social responsibilities of companies, as well as integrated and diversified technologies as consultants to be advanced. Based on real accomplishments that each of them had been accumulating in different fields, the two companies established technological cooperative ties in 2001. After developing the relationship, they eventually merged in 2006 as mentioned in the beginning. The newborn "IDEA" spells out the aim of becoming an integrated consultancy that leads to creation of a new value by bringing together the technologies and expertise that each company had cultivated as a construction consultancy and environmental consultancy. This idea is expressed in its company name, IDEA, an acronym for its business areas: Infrastructure, Disaster, Environment, and Amenity. It is also represented in the Company's mission "to support sustainable development of a safe and sound society, and the conservation and inheritance of a healthy and productive environment". Being a specialist company of technologies related with infrastructure development and environmental science, IDEA devotes its energies to human resource development for technology development as well as upgrading facilities for research and experiment. Various technologies and systems have been developed in a wide range of areas. 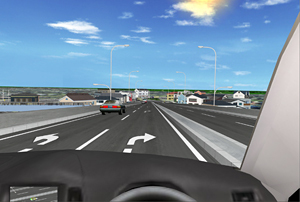 In the areas related with highway and bridges only, for example, the road icing prediction system that utilizes weather forecasting and road surface information, the simulation of transportation policies to prove effect of CO2 reduction, and other simulations are presented in the Company's Web site. 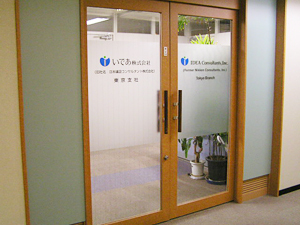 IDEA has a staff of 923, positioned in Head Office in Tokyo, 3 branch offices, 6 major offices, 2 institutes, 37 offices and business offices, and 3 overseas offices, as of April, 2008. "Lithosphere Group", which is introduced here, belongs to Tokyo Branch Office. The group provides consulting services ranging from proposal, research, analysis, estimation to planning and design, construction, and maintenance in infrastructure development on the ground including highways, bridges, tunnels, or town planning. "We think that VR is an effective communication tool (in a wide range of consulting services they are involved with). Therefore, we are positively making good use of 'UC-win/Road', for instance, for proposing and creating VR data after accepting an order." Under a policy to always strive to create new technology and explore scientific study, IDEA is trying to actively adopt advanced technologies. This attitude is also reflected in the actual situation of using FORUM8 products in the Group. One of the proofs is the introduction of "UC-win/Road" and its use after that. The Company has been dealing with VR for long time, since 10 years ago or so. At that time, however, other modeling tools were used, and their reproducibility was limited in accuracy compared with today. Lithosphere Group introduced "UC-win/Road" rather recently; it was in summer 2007, as Mr. Mikio Gorai looks back. 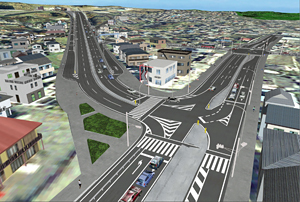 When they won an order of a road project from Tokyo Metropolis, they were required to create VR data for explanatory material for the local community. In that occasion, they adopted "UC-win/Road" as a tool to create VR. They kept on creating the data from December 2007 to January 2008, completing the construction period in March 2008. Actually working with "UC-win/Road", they had a solid sense of its high usability in highway-related services. As there had been a need to use VR as explanatory material of the projects, they were inclined to make good use of it in the following projects after this case. 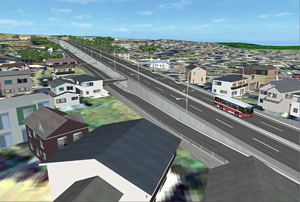 In concrete, expressway projects progressing in Hokkaido and Hokuriku at present can be cited as the examples. As both cases especially required environmental consideration, the Company proposed to create VR data as an explanatory material not only for the local communities but also for related agents such as Ministry of the Environment. Agreed by the customer, the creation of data is now on progress. Recently in bridge-related services, "UC-win/FRAME (3D) is used more frequently than before, as Mr. Hideaki Ando explains. 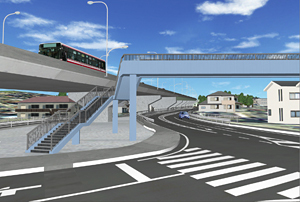 Originally the Group was using "FRAME (2D)" as an analysis tool in bridge design. In 2006, however, there was a case that they had to adopt design of a curved bridge with a large curvature. Then they paid attention to "UC-win/FRAME (3D)" as a tool to enable 3D modeling of stability of a structure and so on in an earthquake and checking from every direction. Mr. Masaya Ichikawa, who actually took charge of the task, explains that it was adopted in the form of upgrading. "Since then, even in the case of a special structural form that does not apply for common design software, it has been effectively used in the form of modeling in an original way and checking." In other words, by using UC-win/FRAME (3D), specific structures such as arch bridges, curved bridges, ramp bridges, and junctions can be freely modeled and checked from every direction, allowing a wide range of applicability. In addition, he mentions its advantages that as visualization makes it easy to know where yields occur in an earthquake, it is easy to use when getting accustomed to it, and that added values are expected. Another background regarding bridges is that design accomplishments of portal rigid-frame bridges tend to increase in recent years, requiring a supporting tool. The demand for this form of bridge is growing because it doesn't need bearings and enables cost reduction as a result. Traditionally, they were using several software tools such as general-purpose design tools including FORUM8's "UC-BRIDGE" in combination. In doing so, they dealt with complex combination of loads. As it was expected that the bridge form would be adopted in a wider scale, there was a rise of the need for the software tailored for that purpose. Then they inquired us, FORUM8, as we'd already had a lineup of tools for "UC-BRIDGE" and other related areas. We started the work to give a concrete form in the spring of 2008, aiming at developing a tool in the coming summer. Lithosphere Group pays attention to the aspect of maintenance, especially for bridge-related affairs recently, intending to strengthen their efforts. According to Mr. Hideaki Ando, one of the examples is to create a database towards building up BMS (Bridge Management System) of the bridges managed by local municipalities. On the other hand, in highway projects, there had originally been the need to give an explanation by using VR through communication scenes of the project such as consensus building and public involvement. Mr. Mikio Gorai expresses his view that more weight will be put on "UC-win/Road" as an effective tool in the future, based on its proven performance. "It should be very useful in a preliminary design or an outline design, for explaining the image of driving in the completed tunnel or how the highway landscape will look, for instance. Some new possibilities can be expected, too." We are most grateful to the people concerned for their cooperation with this interview in spite of their busy schedule.